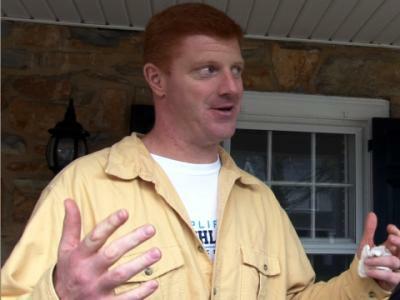 Mike McQueary participated in a flag football fundraiser run by Sandusky. Does it harm his credibility? Does coaching at Sandusky's camp? So in this week's cover story, a former participant in Sandusky's 2004 football camp at Penn State Behrend, Ben Smith, said Mike McQueary was his quarterback coach -- which struck me and others as odd, that McQueary would work for Sandusky two years after the 2002 shower incident. Apparently, though, that was not the only time McQueary and Sandusky were palling around after 2002. According to the attorney representing the PSU administrators facing criminal charges over the incident -- former athletic director Tim Curley and former VP Gary Schultz -- "McQueary participated in a charity flag football game that Sandusky coached just 27 days after the locker-room assault he described to the grand jury." "If it were true that Mr. McQueary actually observed Mr. Sandusky sodomizing a 10-year-old boy in the shower, any information that depicts Mr. McQueary socializing with Mr. Sandusky at any time after the alleged 2002 incident raises doubts about Mr. McQueary's grand jury testimony and calls Mr. McQueary's credibility into serious question," Pittsburgh attorney Thomas J. Farrell said Tuesday. Defense attorneys are mixed about such an appearnce, according to the article. Some say this hurts McQueary's credibility, others say the appearance depends on context. In any case, Schultz' and Curley's lawyers asked prosecutors "for any records showing McQueary had socialized with Sandusky after the incident." Erm, I imagine they'd be interested in what Ben Smith had to say. I'm not crazy with the idea that my report could contribute to the defense of Curley and Schultz. After all, that McQueary continued to have a relationship with Sandusky isn't proof of anything -- for starters, few of us can really understand the pressures McQueary must have felt at Penn State to go along with business as usual.